I approached Imprint: A Memoir of Trauma in the Third Generation (Caitlin Press, 2017) with reluctance. 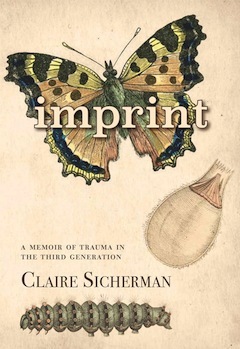 But Claire Sicherman’s account of her murdered family members, of her grandparents who were the sole survivors of the Holocaust and of her own intimate life as granddaughter, woman, wife and mother is profoundly moving and tender. Her accounts of her relatives’ lives and deaths under the Nazi regime are brutal and shocking. The proximity of these emotions makes the book challenging to read but hard to put down. For Sicherman, the emotions related to the destruction of her family are permanently imprinted in her body and in her genetic makeup. She must now bring them to conscious awareness. The juxtaposition of cold, hard accounts of death – as in the chapter “My Family” at the beginning of the book – immediately followed by the first letter to her 9-year-old son Ben, signed “Love Always,” warns the reader that what follows is not for the faint-at-heart. She alternates between three essential narratives: the telling of the destruction and deaths of her relatives in Poland; the survival of her grandmother and grandfather, which leads to the intimate story of her mother and Sicherman’s youth; and the traumatic birth of her son Ben, which acts as a catalyst, breaking through lifelong barriers of ignorance, denial and grief. In gazing at the cover of the book, the three images of caterpillar, cocoon and butterfly began to make sense. This metamorphosis becomes the symbol of Sicherman’s lifecycle; the lack of awareness of her family’s history, the birth of her son, and her desperate search for knowledge and understanding of why she suffers from chronic health conditions, anxiety and depression. Sicherman’s answer to the question “why” lies within the concept of epigenetics, the study of heritable changes in gene expression. Traumatic events cause changes in gene expression that can then be inherited. For Sicherman, her task is to explore, through various forms of therapy, the intergenerational transmission of trauma – the genetic imprinting of the horrors that befell her great-grandparents, her great-aunts and great-uncles and their progeny. Despite the distance of being a third-generation Holocaust survivor, her writing captures the beauty and intimacy of family affection (“My Babi,” “My Deda”). Hope of healing and surviving trauma permeate the pages of this creative book, offering acceptance and guidance to others of her – and the next – generation.